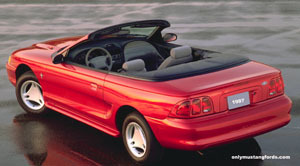 The 1997 Mustang was yet again a hump year carryover, with little new to show the buying public. And if you've been following the Mustang years on this site, this was a common issue. My personal opinion, from having worked for several major OEM parts manufacturers is that the real profits in these cars for Ford and its suppliers comes from the last couple of years after the tooling is paid off. So although sales slump, like they again did for the 1997 Mustang, the company was still making good money and the drop in sales was a good trade off for the bean counters because their profit margin more than made up for it. Not so much the pony car buying public, as sales fell to just over 108,000 from the previous year's 135,000 and the 185,000 plus vehicles sold in 1995. Just for fun Ford removed the honeycomb grille it had just added the previous year. Other than that, you'd be hard pressed to find the difference between a 96 and a 97 Mustang. The only other change of note, was the elimination of the Mystic paint option. A new 17" wheel option on the GT was the only other distinguishing factor. The engine choices and power output for 1997 was identical to the 1996 model year. The standard 3.8 liter V6 offered 150 horse power, while the V8 options were the GT package 4.6 liter modular overhead cam engine with 215 horsepower. The SVT Cobra was again available with the aluminum 4.6 liter modular DOHC (dual over head cam) engine and provided a strong 305 horse power. Now that these cars have been out of production for many years and engine replacements have become necessary for some, it isn't unusual to see performance enthusiasts tearing out the modular 4.6 blocks and transplanting 5.0 liter V8 engines back into these cars. Cheap parts and reliable big performance gains are the result. That's not to say there can't be problems when doing performance modifications to these cars.